The Saab 9-3 model is a compact executive vehicle that has become particularly popular since being in production from 1998. Catering to the need for space for modern families as well as the corporate style required by business owners, the model’s versatile look and features have made it a common sight on UK roads. The 9-3’s grille is a particularly iconic part of the vehicle’s exterior appearance, but when the existing grille of your Saab becomes worn, faded or damaged, you may think that finding a suitable replacement is difficult. With the help of specialist stainless steel car grille company Zunsport, you can access lower grilles for your Saab 9-3X for £79.24. 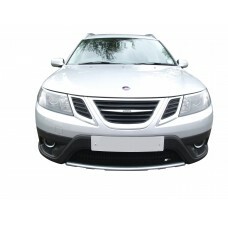 Our Saab grille is also available with a black finish for just £95.52. Suitable for models manufactured from 2008 to 2012, our Saab grilles use the highest quality materials to guarantee protection from road debris and general wear so you can enjoy an enhanced appearance for years to come.